One of my favorite things to do in NYC is to check out new fitness classes. I get to edit the Body section of Dance Spirit (including Health, Nutrition, Mind and Fitness stories), so not only do I get to break a solid sweat, but it's also technically considered research for my job! Two birds, one...water bottle? Um, Mahri is gorgeous. Like the kind of the kind of pretty you can't look at directly or you'll burn your retinas from all the hotness. But you can't hate her—she's probably the nicest person I've ever taken class with. So she's basically perfect. I'm still awaiting her response about my request to "please teach me everything you know about being beautiful and sweet." The class is ideal for dancers. You start with some simple stretching to get warm, followed by 15 minutes of cardio. Think lots of jumping jacks and fun side-to-side, forward-and-back dance moves. Next, you get into the strength training portion of class. We used 2-lb. weights (don't underestimate the power of tiny dumbbells!) to do lots of small movements and pulsing. Then we moved into lower-body stuff, like lunges and curtsy-squats, and my legs were visibly shaking. Then I was excited because we got to "come down onto the mat," but that didn't mean we got any sort of break. Instead, we did some ab work (my favorite) and bum exercises, which were killer. Finally, we wrapped up class with some return-to-high-energy dancing in the dark (yup, really). So go check it out. You'll love Mahri and I promise you'll feel the burn. Remember: stronger body, stronger dancer. 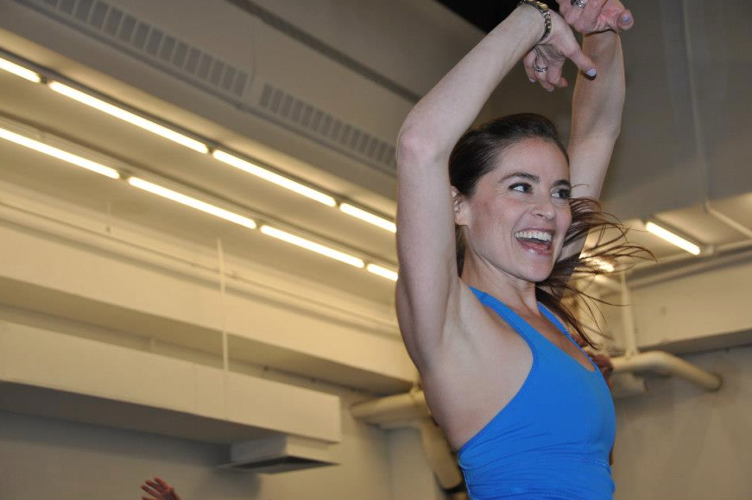 Mahri's classes take place at the Dance New Amsterdam studios and your first class is only $20.